A unique opportunity to help conserve this wondrous plant for the future. Easy to grow and something that very few gardeners will have. Possibly the world's rarest houseplant with only 7 specimens left in the wild. Comes fully established, height including pot 60cm. Brighamia Insignis, the Hawaiian Palm, is a critically endangered species of plant, and with just one plant thought to be left in the wild*, we’ve managed to get a limited stock of specially cultivated examples of this exotic specimen. 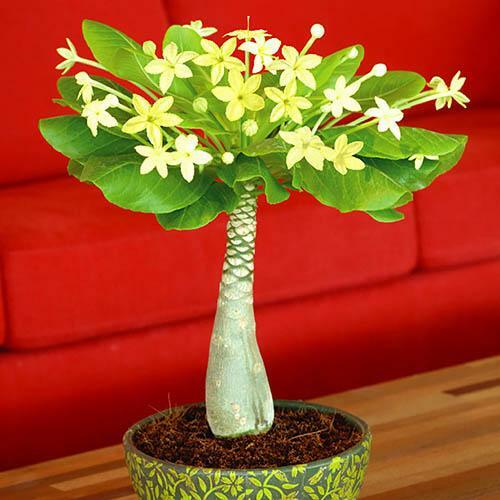 This unique plant is only available in limited numbers so be quick to order! Also known as alula (or Olulu) in Hawaiian, and also the vulcan palm, the uniquely beautiful ‘Hawaiian Palm’ (Brighamia insignis) was once very common on the islands of Hawaii – but sadly no more because the specific hawk moth responsible for its pollination has all but died out and also as subsequent hurricanes have decimated wild populations. Luckily, and before the last remaining plants were destroyed, some plants were found clinging to a vertical volcanic rock face and were successfully hand pollinated and their seed collected by plucky botanists to ensure its continued existence. Now, having nurtured the seeds over the last few seasons, we are delighted to be able to offer the Hawaiian Palm for sale in the UK - and you’ll find it’s perfectly happy being the centre of attention in your living room or conservatory. An outstanding and easy-to-grow succulent plant with a sweet fragrance when it flowers, The Hawaiian Palm has a thick trunk topped with a rosette of shiny leaves and makes a very unusual and decorative houseplant - something that not many people will actually have. This is a wonderful opportunity for you to grow one of the rarest house-plants on earth and actively participate in its conservation. Give the plant a sheltered position in the house or garden in summer to prevent excessive leaf drop, and place in a light position indoors in winter for the best results, keeping it frost free. The Hawaiian Palm enters dormancy during the summer returning to growth again from August, when new leaves will develop in the crown. Older leaves at the bottom of the plant yellow and fall off naturally during the growth cycle forming the characteristic succulent trunk - remove fallen leaves regularly. The plant can reach a height of 1m, so keep an eye on it as it grows and pot up into a larger pot as necessary to prevent it becoming top heavy. Supplied as a fully established plant 60cm tall including pot. Your Hawaiian Palm will be delivered with fresh foliage but not yet in flower - NB transportation stress can cause a loss of leaves however new leaves soon form, adapted to your home conditions. Please note that the decorative pot is not included, see ‘as supplied’ photo. 60cm tall including pot. Plants are not in flower when sent. Easy to care for, allow the soil to dry out slightly before watering as the succulent stems store water - the plants need to be watered less than other houseplants. Watering only once a week at most, allow the soil to dry out between waterings. Feed once a month throughout the year with a half strength, general-purpose feed. Give the plant a bright, sheltered position in the house. In the summer, your Hawaiian Palm will be happy in a sheltered position outside. The main growing season is over the winter months, and your plant will start into growth in August. Re-pot the palm in a larger pot every year.